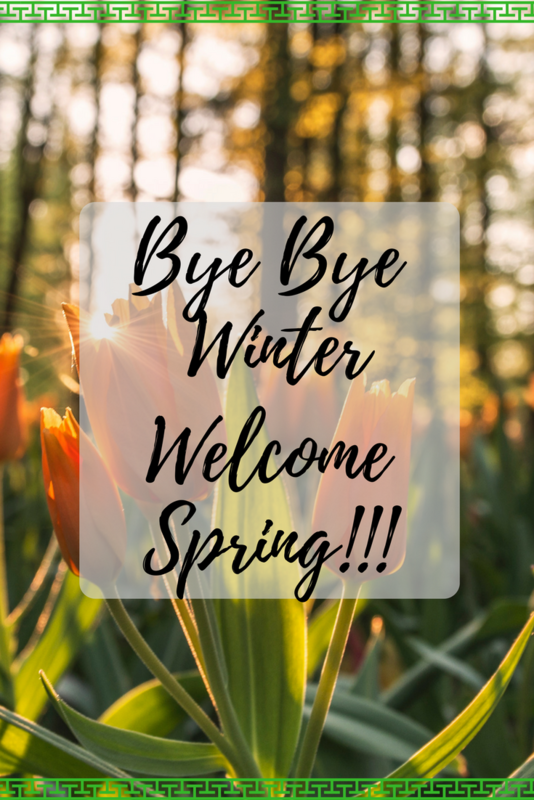 Bye Bye Winter and Welcome Spring!! Since March month starts I was eagerly waiting for spring. Before one week of spring, we had a snow storm and it dumped 10 inches of snow. Can you believe it? After snowstorm temperature rose till 50 and finally all the snow melt. Now the ground is clean with no sign of snow. I am so excited to see colorful flowers, green grass, and buzzing bees. Each season has its own glory. I like winter when it snows but that bitter cold is sometimes unbearable. In Midwest spring is somewhat windy, so if the temperature is above the 50s and sunny then you can enjoy outside. I am so ready to say goodbye to my winter coats. Even though whole weeks weather predictions don’t sound good. This year we even got few spring days during January and February. Hence, we enjoyed “A warm day in Lake Geneva” and few brunch places. It’s March 20 and now I am totally ready to say bye bye Winter and Welcome Spring!!!! This year winter was not too bad in terms of a snowstorm and windy situations but those dry trees make me feel down. It feels like everything is gray and no colors around. Even winter outfits come in those dark colors, which drain your energy. This was the situation before one week of spring. Anyways spring has begun and I am so excited to work on my spring bucket list. The major part is gardening projects, which takes plenty of time. Let me tell you I have no experience with gardening and I am still in learning stage. I have started from last two years and keep increasing the plantation year by year. This year I am planning to grow green chilies, mint, and basil. You’re saying hello to Spring and we’re saying goodbye to Summer! Autumn started with a heatwave here, which is funny as you said Spring started with lots of snow for you. But we must agree, each season has its own glory! We are actually looking forward to Winter, snuggling up under lots of blankets, hot chocolate and all the rest. Love your Spring Bucket List! Gives us the idea to write up our own Autumn version. All in all, really enjoyed your post and we’re wishing you a blessed Spring! I’m jealous that you don’t have any snow on the ground! We got 20 inches in a blizzard and it’s still here lol! I love your springtime bucket list, especially running in a color run, that always looks like so much fun! We’ve been ready to welcome spring too – we’re looking forward to bright colors, flowers, and most of all, sundresses! Maybe not quite as excited about the allergies that come along with all those flowers, though – ha! I love this bucket list. We’ll probably be doing some of it. My daughter loves to hunt for bugs. SPRING!!! Yes!! Goodbye winter!! I am so over this cold weather.I love the light breeze and rainy air. I’ve never made a spring bucket list but I would like to do that. It’s so exciting to finally welcome Spring! I’m sure everyone’s just as excited as I am. I think it’s awesome that you have a bucket list for the season! I had a feeling that the Winter never want to say goodbye. We’re finally welcoming Spring! You bucket list sure looks like a lot of fun! Am happy that its Spring! It’s time for me to wear my spring clothing and more florals! I want to borrow your spring bucket list. I’ve not thought about some of the things on it. I am so happy that spring is here even though it feels like we skipped spring with our 90 degree weather. Thanks for all the great tips. Can’t wait to get started on all the spring cleaning especially outside. Looking forward to the nice weather. I am so ready for warmer weather! Time for spring cleaning! I’m so happy spring is finally here!!! Yay for warm weather and pretty flowers!! !